Rensaissance Italian art has older roots than most people think. It didn’t emerge in Florence, Rome and Venice in the 15th century from out of nowhere. Its roots are very deep and multidimensional. 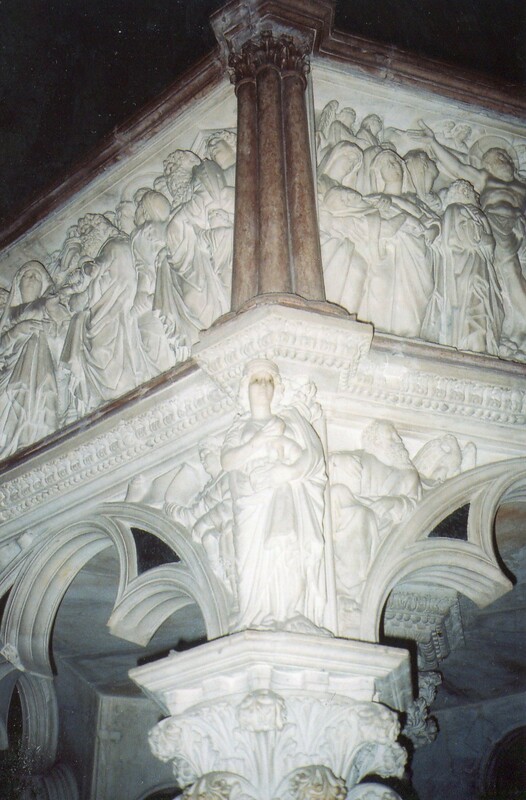 Nicola Pisano sculpted the marble pulpit for Pisa’s baptistery (above) in the mid 13th century, and he used ancient Roman forms. In the Adoration Of The Magi scene above, the people are as monumental as ancient senators. 1. Emperor Frederick II (1220-50) ran the Holy Roman Empire from southern Italy, and he commissioned classicized art to bolster his prestige. 2. 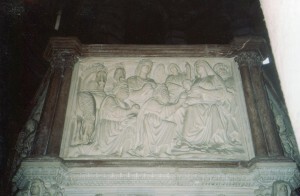 Ancient Roman sarcophagai were heaped around Pisa’s cathedral. 3. Pisan architects were using ancient Roman arches and columns in buildings. Pisa identified with ancient Rome as it began to grow and vie with Florence for commercial dominance back in the 11th century. So Nicola grew up with a lot of ancient Roman currents. The people that Nicola sculpted dominate the scenes–they’re as high as the framework that encompasses them. They’re deeply cut and their drapery’s massive. Nicola was blending ancient Roman images of heroism with Christian values, like fortitude. But Nicola’s mind was still in the Middle Ages. The pulpit has 6 sides because 6 meant death in medieval Christian symbolism. The adjacent octoganal baptismal font has 8 sides because 8 symbolized the Resurrection. And the building’s round because this shape symbolized eternity and God. Pythagoreans associated static geometric shapes with divine proportions of the cosmos in antiquity. Christian thinkers integrated this idea with their new religion’s symbols. 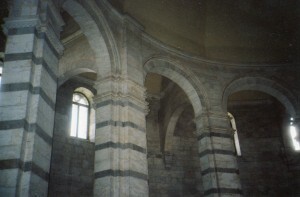 The builders of Pisa’s baptistery blended the arch from ancient Roman architecture with salvation (above)–the soul attains permanence. So Nicola lived in a world with many currents from ancient Greece and Rome, and they had fused with Christian art and ideas in lots of ways. Unlike Thailand, the West has focused on permanent geometric shapes, and this focus has many dimensions, like Thai thought. Nicola has been seen as the founder of Renaissance sculpture, but he was integrating many currents from the past. He might have felt that he was soundly within Roman traditions by sculpting monumental figures to vivify Biblical themes. But by expressing ancient Western assumptions, he helped advance them in directions he might not have envisioned. Nicola’s work inspried the early 15th century Florentine sculptors Ghiberti and Donatello, and they developed his perspectives in works on Orsanmichele, which began to depict the modern individual and the body’s flesh. As you examine the West’s focus on static shapes and realistic portrayals of the human body, you can find so many dimensions that you might feel that you’re in paradise. Now go and explore a Thai wat and compare both cultures, if you can handle this much light.